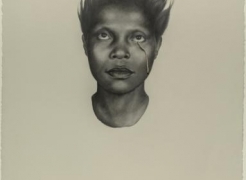 From October 2016 to January 2017, The Phillips Collection in Washington, DC, hosted The Kin Series and Other Related Works. The major exhibition focused on Lovell's Kin series and his most remarkable Tableaux and other installations. 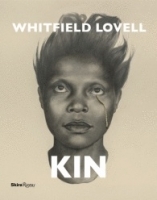 A monograph, Whitfield Lovell Kin, was published in tandem with the exhibition by Skira Rizzoli. 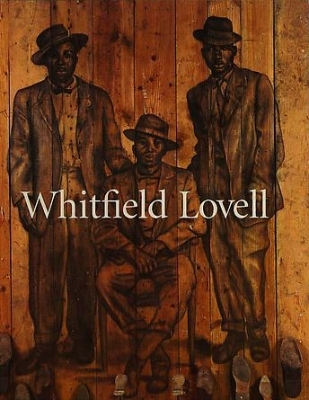 From May to October of 2013, The Hunter Museum of American Art, Chattanooga, TN hosted a major exhibition of works by Whitfield Lovell. 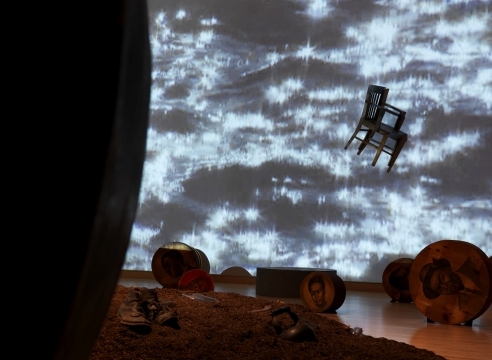 The exhibition featured works from the last five years of Lovell’s career, including large-scale tableaux, as well as Deep River, a new site-specific installation. 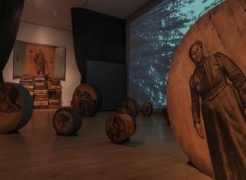 The installation explores ideas of memory, identity, freedom and passage, and it includes portraits on wooden discs as well as video and sound elements. 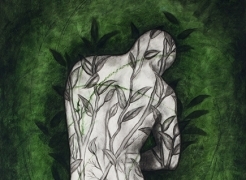 History and memory have inspired Lovell’s work for a number of years. 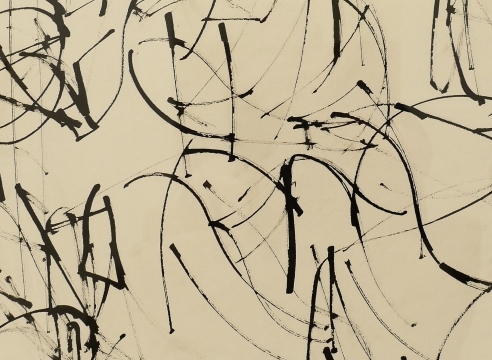 During the 1980s and early 1990s, he created large-scale oil stick and charcoal drawings that allegorically examined issues of family, identity, gender, love, death, loss, and the passage of time. 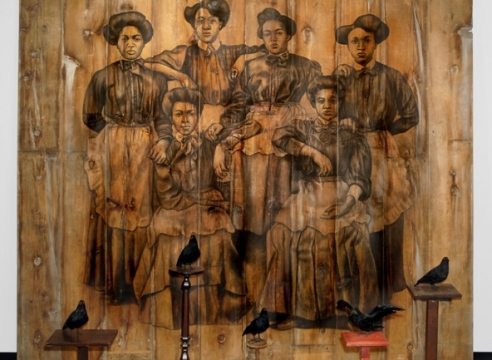 Lovell was working mostly from family photographs, juxtaposed with symbols and found images. Lovell’s most recent works are his “tableaux,” in which he combines Conte crayon portraits on antique wood panels with found objects. 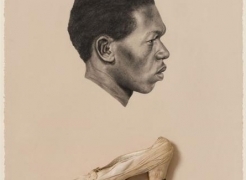 Lovell draws upon a personal archive of hundreds of studio photographs of anonymous African Americans, most dating from the early years of the twentieth century. It is by looking through these tintypes, cabinet cards, bubble-glass portraits, and postcards that Lovell develops each individual work. 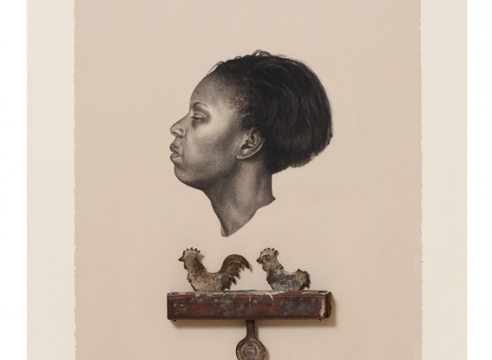 Once an image has captured his attention, Lovell draws freehand in charcoal on the panels, which range in size from small, hand-size discs to multiple large pieces that extend across a museum wall. 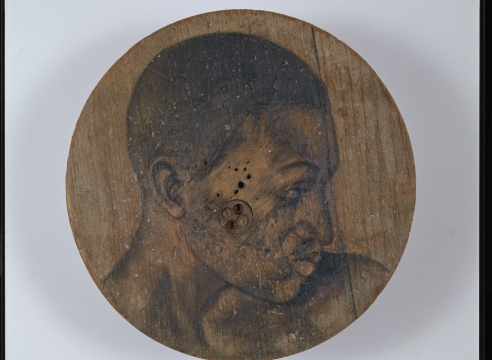 Lovell gives careful thought to the grain and texture of each surface as well as to any remnants of color from paint or wallpaper, making the background for each drawing as unique as the person depicted. Lovell then adds found objects in an intuitive process that varies from piece to piece to create three-dimensional tableaux. 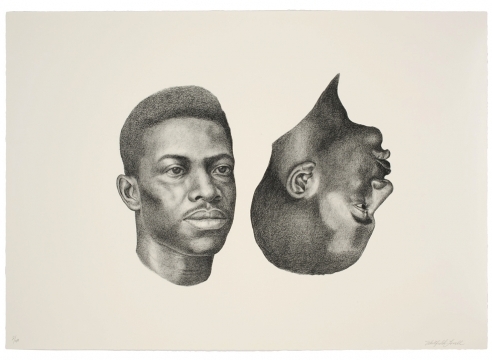 Recent works also include Lovell’s Kin Series, a group of Conte crayon drawings on paper that feature stark portraits of early- to mid-20th-century African Americans. As in Lovell’s tableaux, these images are paired with objects including playing cards, flags, ropes, vessels, and jewelry, suggesting personalities or life experiences. 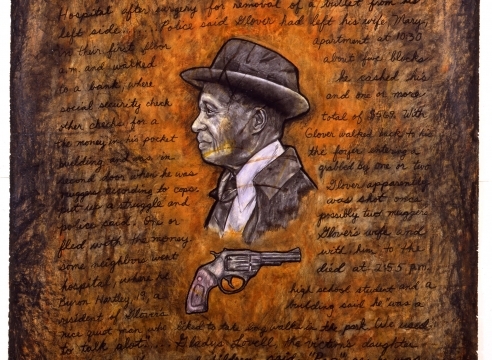 Lovell’s inspiration comes from songs, films, and poems, which he alludes to in the titles of the works, compounding the psychological and sociological resonances of each piece. 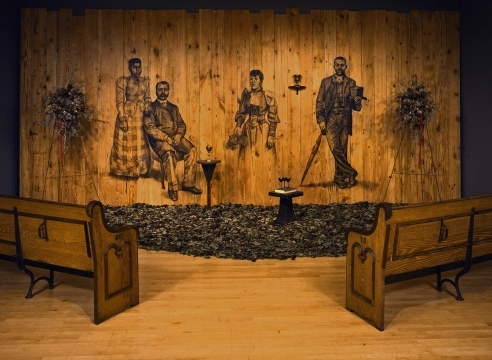 The freestanding tableaux developed out of a series of installations that Lovell has created over the past twenty years. Lovell’s first installations, in a 19th-century slave-trader’s mansion in Italy, in an abandoned 1930s row house in Houston, Texas, and in the former barracks of a 16th-century Spanish fort in Havana, Cuba, recognized and utilized the ambiance of the existing historical spaces. 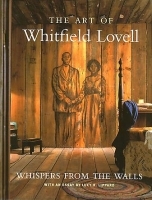 Lovell began by making marks on the walls and progressively worked his way out into three-dimensional, theatrical space. 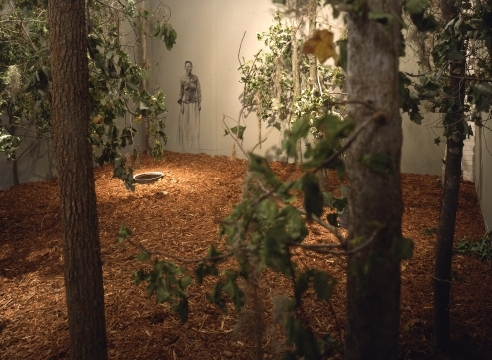 Lovell’s fourth installation, Whispers From the Walls, was created during a residency at the University of North Texas Art Gallery in Denton during spring of 1999. Here, in a nondescript modern gallery space, Lovell created a small rectangular house built of salvaged boards with various colors of peeling paint. The floor of the gallery was covered with soil and old clothing, over which viewers walked to get to the house. Inside was a single room complete with furniture, clothing, personal and household objects, and sound. 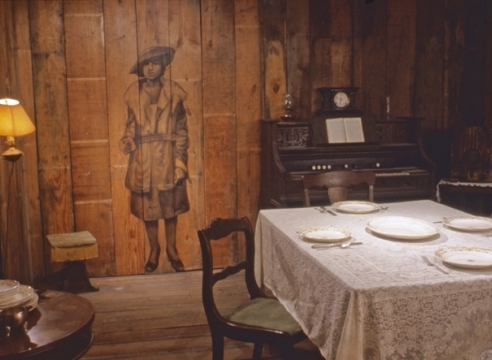 Life-size charcoal drawings were made directly on the walls, suggesting past residents who might have inhabited similar spaces. 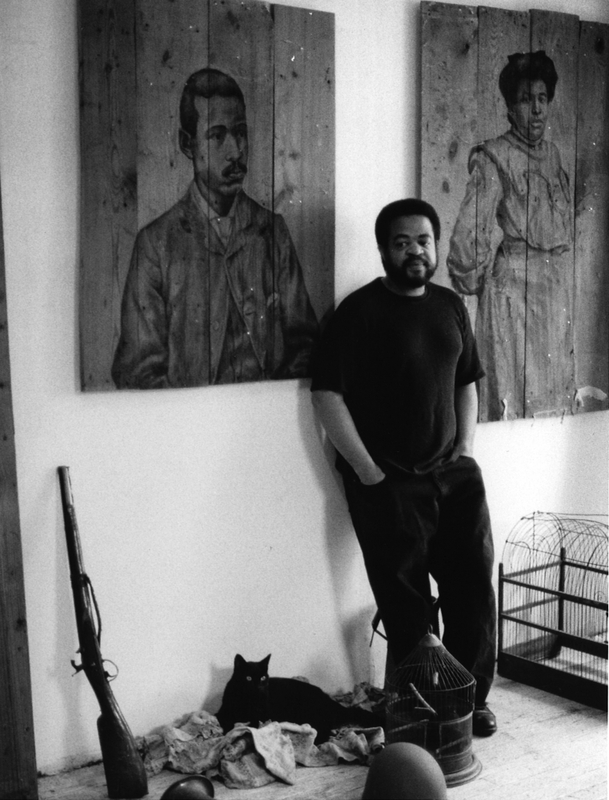 The exhibition received much critical acclaim and toured nationally, appearing at venues including the Seattle Art Museum and New York’s Studio Museum in Harlem. 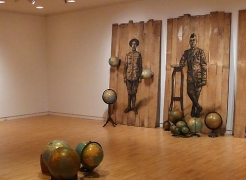 Lovell’s major installations include: Visitation: The Richmond Project, which traveled to the University of Wyoming in Laramie, the Columbus Museum in Georgia, and the Museum of Contemporary Art in Sydney, Australia; SANCTUARY: The Great Dismal Swamp at the Contemporary Art Center of Virginia in Virginia Beach, VA; and Grace: A Project by Whitfield Lovell at the Bronx Museum of the Arts in New York City. 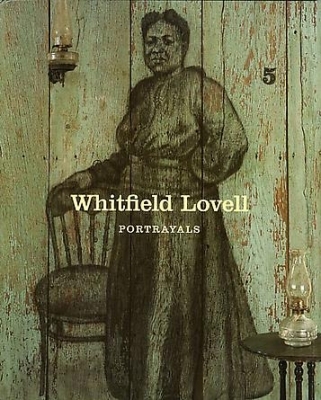 Works by Whitfield Lovell are featured in major museum collections including The Whitney Museum of American Art, NY; The Metropolitan Museum of Art, NY: The Corcoran Gallery, Washington, DC; The Smithsonian American Art Museum, DC; The Smithsonian National Museum of African American History and Culture, DC; Pennsylvania Academy of the Fine Arts, PA; The Yale University Art Gallery; The Hunter Museum of American Art, Chattanooga, TN; The Brooklyn Museum, NY; The Studio Museum in Harlem, NY; Seattle Art Museum, WA, and many others. 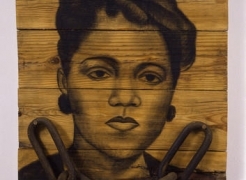 Hyperallergic: "Mining Portraits of the Past for Stories of Our Shared Humanity"
Folio: "Whitfield Lovell's Cummer Exhibit is a Profound Meditation"
Florida Times Union: "New Cummer Exhibit: Whitfield Lovell: Deep River"
Arbus: "Whitfield Lovell: Deep River"